To me, spring is that short period of time when I like to accomplish a whole year’s worth gardening tasks. It is a frenzy of raking, weeding, planting and laying out new of ideas before the summer heat arrives. I am never able to complete all that I want to, but I certainly enjoy trying. Now I know not everyone gets excited pulling wood sorrel and stray clumps of grass after a day’s work. And what I like about gardening may be exactly what someone else wants to avoid. But there is common ground and more importantly, common plants to suit our different points of view. Although a meticulous and well kept garden showing off a wide variety of species may be pleasing to the eye, it does require a significant amount of time to layout and maintain. If weeding, mulching, planting and watering aren’t things you like to do on the weekends, then it may be better to keep it simple. The reason we encourage planting so much at LEA is because trees, shrubs and even perennials have much bigger roots then lawn grasses and these roots help absorb water before it gets to the lake. Lawns often prevent surface erosion but they have little capacity to absorb stormwater runoff. A natural undisturbed buffer of native trees and plants between development and any waterbody is the best way to treat runoff. However, for many lakefront landowners, it is still seems like too drastic of a change from a grandfathered lawn down to the water. Lawns are often viewed as a low-maintenance and easy to take care of part of the yard. But this really isn’t true. Without even taking into account all the pampering that most lawns need in Maine to stay lush and green, the grass still needs to be mowed at least once every week or two. In my mind, that is time or money that could be uses be used in other, more productive ways. In high-use areas where there is a lot of foot traffic or general assembly, a lawn can be a very practical use of space. But for one reason or another, lawns have continued to grow and grow around our homes. Maybe because it is easy to throw seed on bare ground and have grass germinate. Of course maintenance is another story…. But if the only time you are spending on your lawn is behind a mower, then perhaps you are ready for some alternatives. One of the keys of low maintenance is to keep it simple. Instead of working with a bunch of plants, concentrate on one or two and use them to fill an area. If you don’t want to spend a lot of money up front then sparsely fill the area you want planted. This may mean some weeding in the meantime, but eventually they should grow into each other. If you want more immediate results then spend a little more now and plant the area more heavily. Bearberry, creeping phlox, foam flower and dwarf or crested iris are just a few New England natives that will grow into each other nicely to form a thick bed which will require little maintenance. Having a lush bed of low growing shrubs is a nice way to add variability, accent and beauty to your property without reducing your view of the water. Shrubs and perennials can also serve as a great transition between different landscape features. Most often, people begin by planting around the house to cover the foundation and soften the straight lines of the building. This same idea of a transition zone can be used alongside walls, patios, and the edge of the woods water. Planting in straight lines or geometric shapes is often much harder than it looks. Naturalized or vernacular gardens are easier to install and often blend better within the landscape. Clumps of three or five can give the impression of a more robust form and draw the eye in without all the hard edges. If you start with some good plants and give them a little time to settle in, it may be your lawn that starts to look like the real hassle. And soon enough you could have a different flourishing spread of green that really is easy to maintain and one that will help the lake stay blue. Bearberry is a low growing shrub that more and more people are starting to use but it is still not commonly seen in most gardens. It doesn’t get much above 6 inches so it is truly low growing, which makes it an ideal replacement for lawns or over rock gardens. Its deep green, glossy pea-sized leaves will densely cover the ground in areas of full sun. It doesn’t need to be pampered and often grows best in poor, shallow, and well drained soils. This makes it a good candidate for sunny, rocky slopes. The small white-pink flowers bloom in early spring followed by often inconspicuous red berries later in the summer. 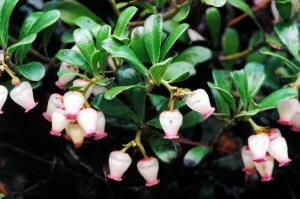 Enjoy bearberry for its form, texture and function in the landscape. Creeping phlox (Phlox stolonifera) – Much less demanding than tall garden phlox, this spreading groundcover is easy to grow and native to the northeast. 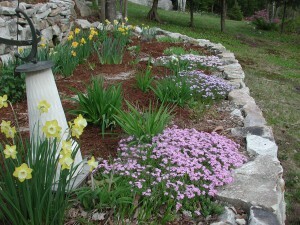 Plant a few healthy clumps of creeping phlox in an area, let them grow into each other and say goodbye to the lawnmower. Plant in part sun to shade. Dwarf Iris (Iris verna) – This New England native and it’s relative Crested Iris (Iris cristata) are beautiful miniature irises that together can adapt to a variety of conditions. Dwarf Iris is grows well in sun to part sun and can tolerate fairly dry soils. 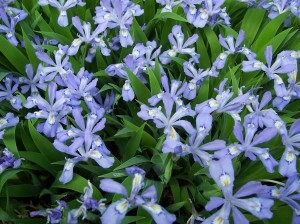 Crested Iris is slightly larger at 6-8 inches and is better for shadier, moist sites. They both can spread rapidly and their short lance-like leaves make an attractive groundcover. Beebalm (Monarda didyma) – With the exception of cardinal flower, I cannot think of another Maine native with such vibrant deep red floral color. Butterflies and hummingbirds frequent this mint relative when in bloom. 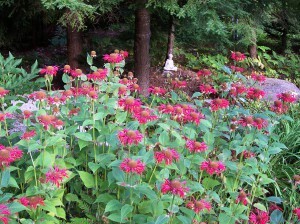 Because Beebalm can spread aggressively in moist, partly sunny sites, it may be a good idea to plant in a defined space and just let it take over. 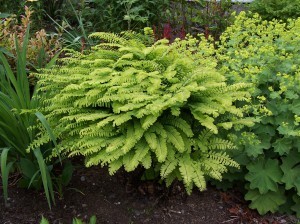 Maidenhair Fern (Adiantum pendatum) – This is one of my favorite native ferns. It has a unique shape that allows it to stand alone but also works well in group plantings. It likes moist organic, moist soils in at least part shade and can be a nice solution for those canopy covered damp areas that are often difficult to fill. Creeping Juniper (Juniperus horizontalis) – Sure, everyone knows creeping juniper but it is still an important staple in the low maintenance garden. It is low growing but has a substantial root system and can spread nicely into a thick carpet of green. Although creeping juniper is native to Maine you will only find cultivars available commercially. ‘Bar harbor’ is one of my favorites and is aptly named for its sea-green foliage. Junipers are very drought tolerant and work well on sunny sites with poor soils.